I am waiting for Jerry Bingham to arrive with his big rig and heavy duty equipment to thaw out my frozen water line. It will be awhile. I am not his only customer in this fix. Fortunately I have eight gallons of drinking water, six entertaining books, and quantities of excellent treats. I made an expedition to Central Lake to acquire these supplies, and on the way home found reason for hope. We are a resilient and creative people in Antrim County. 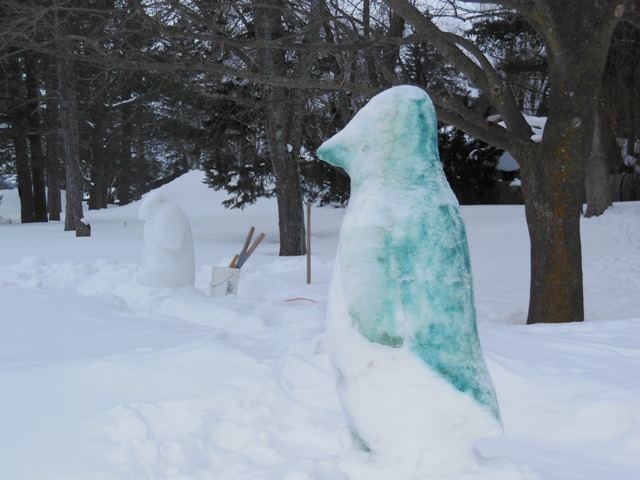 Daugherty Johnson, the Sculptor of Eastport*, has been making good use of our abundant snow crop. Last week I showed you one of his penguins in process. Last night I saw it wearing a blue tuxedo. 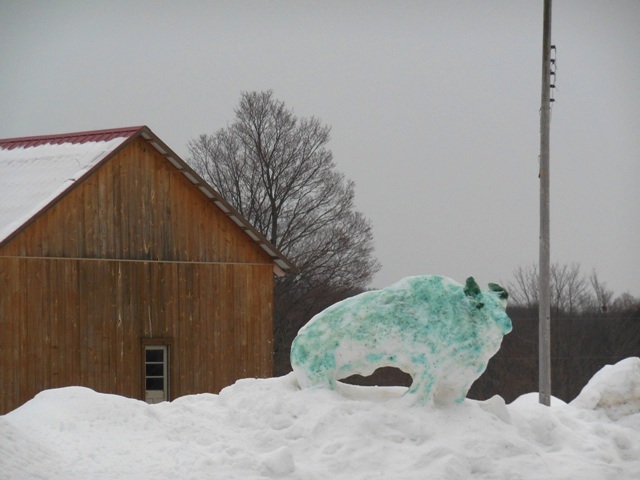 There is a blue bison up at Providence Farm. Frozen cherries, their little stems blue from the cold, perch on the snowpiles at King Orchards. The use of color is a departure for Daugherty. If I can catch up with him I’ll ask him about it. We’re all grateful to him for giving us a reason to appreciate the snow. We are all growing just a bit weary of it. Not as weary as the folks in North Carolina and Georgia who are hunkered down with that deer-in-the-headlights look asking themselves Why us??? but . . . weary. 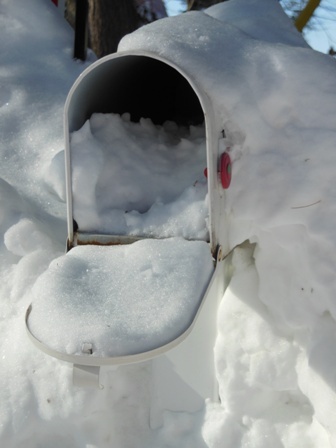 And now a Public Service Announcement: secure your mailbox or Mama Nature and Antrim County snowplows will leave you no room for your Valentines. *Longtime readers will remember Daugherty’s work from past winters: howling wolves, dancing castles, the hunters and the mammoth. Way too much snow..can not imagine it can all melt by summer! Wait, wait – we’re going to have summer again? All I know about the color would be these three things: Daugherty Johnson has a whole lot of respect for Mama Nature, Providence Farm is Certified Organic, and King Orchards produces food at that location. Now what you really want to watch out for is the yellow snow around the Writing Studio and Bait Shop . . . I like that sign at the church. Did you see that Lake Michigan is about 80% frozen? And, are you going to have to let your water run now? I like the sign too. 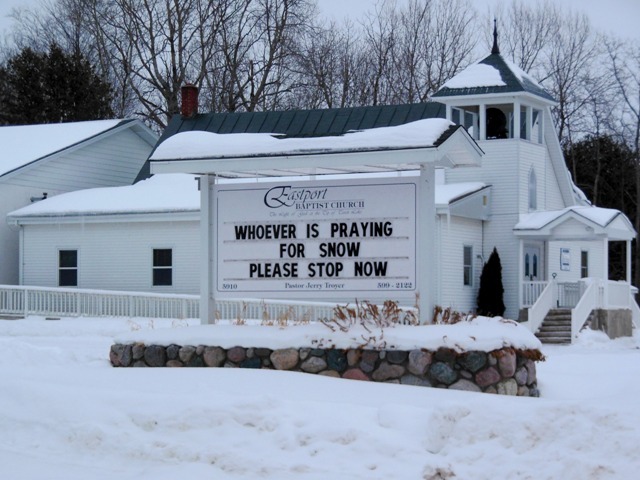 They asked so politely that I’ve decided to stop praying for more snow. I’ll bet that what all those Freeze Reports really mean is that the surface of Lake Michigan is about 80% frozen. If I’m wrong about that we’re in more trouble than I thought. I will leave the water running at night and will put a small heater down in the crawlspace to run when I’m here and awake. (I’m way more afraid of fire than of ice.) The rest of the time I’ll rely on Hope. I am glad that you have got something to smile at. Frozen water supply is not amusing at all. Very true – but as it happens I have water once more. The valve on the pressure tank was all that was frozen. So now all I have to do is brave the crawlspace to put the little heater in and then go down there to check on the valve now and then. I hate the crawlspace. I wish Miss Sadie had opposable thumbs. 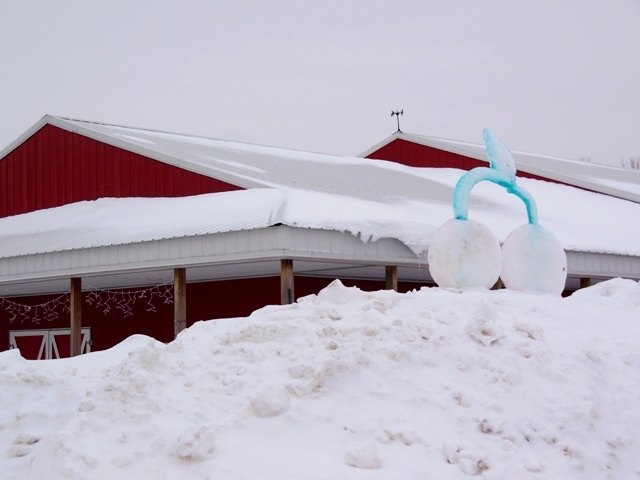 Even Iowans know about fun snow sculpture. Of all things, I still have a photo of the snow cardinal I built in front of our house when I was in high school. No color, though. I’ve never seen that before. Sorry about those frozen pipes. Back in the days of the Great Freeze of ’83 here in Houston, we were in the 20s long enough that pipes all over town were breaking. Uninsulated pvc doesn’t do too well in such conditions. In any event, when they broke at my apartment complex, it flooded the concrete courtyard with about two inches of ice, and some of us who still had skate went ice-skating. It almost made up for toting buckets-full of water from the swimming pool to flush the toilets. The cardinal is very cool. Turns out the well line wasn’t frozen after all – just the valve on the pressure tank. Not that the well line couldn’t freeze too, but one can hope. It’s pretty rare for plumbing pipes to burst in occupied housing Around Here. Generally that only occurs when someone closes up a house and turns the heat down too far–which is why most people who leave for extended periods turn off the water supply and drain the pipes. It occurs to me that all of us are more or less well-prepared for the things we expect to happen, but not so much about the things that surprise us. In spite of my grousing we manage snow and cold pretty well up here. (Actually now I think of it one of our best coping mechanisms is grousing.) California building codes anticipate earthquakes. Florida is more or less resigned to hurricanes. I would be very surprised if anything in Torch Lake Township remained standing if we had an earthquake. And look at Atlanta in a real snowstorm. We do the best we can and keep on keeping on. I hope you are all thawed out now by the time you read this comment. I am home from work on snow day number 2 this week, with a dog as an ottoman as I visit friends in the blogosphere. We received enough snow from this storm where I’m sure my duo and I could also go out and create snow sculptures if we were so inclined. I’m afraid Teddy’s color of choice, however, would be yellow. I think it would be wonderful to have an ottoman dog. My granddog Fred was good at that. Miss Sadie and the Cowboy have other ideas. We are all thawed out. I’m going to brush off last night’s snowfall and make my way to a broadband connection so I can read other blogs. Enjoy the snow day. Always good to have one here and there. Happy Valentine’s Day, Gerry–Glad your well problem proved less dire than expected. Happy Valentine’s Day to you, Craig. The freezing problem was sort of a warning. We are not out of the woods. But then I live in the woods . . .
During one of our bitter spells I found out a basement pipe had frozen the hard way… it burst. Lucky I was home. I think you have the right plan for surviving in your water-less home. Hope all is well by now. I am sorry your pipe burst. I am glad you were home. All is well here now – and we have our paws and fingers crossed that we will get through the rest of the winter without further difficulty. We’re over the hump and heading for April. Hang in there. Hanging is precisely what we are doing. Hurry April. Already did the frozen water pipe thing twice now. hurry up April! !